At Proficio we love our clients…and that’s not just lip service. We form a true partnership with our clients from day one to create a cybersecurity program that meets their objectives, timelines and budgets. Let Proficio show you love, by delivering world-class cyber protection. So are you ready to love your cybersecurity services provider? 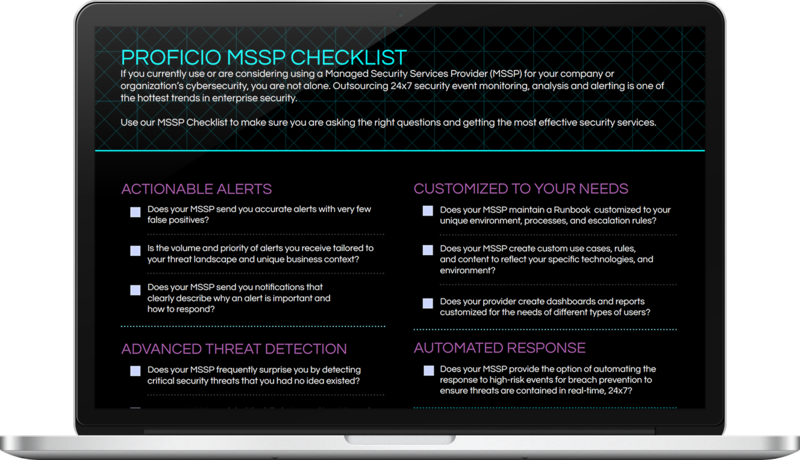 Use our free MSSP Evaluation Checklist to make sure you are asking the right questions of your current or prospective cybersecurity services provider. Proficio is a world-class managed security services provider (MSSP) delivering managed detection and response, 24×7 monitoring and alerting, and custom cybersolutions to our clients globally.